The major US indexes were mixed in Thursday trading with tech-heavy Nasdaq closing effectively flat (-0.02%), while the S&P 500 dipped 0.20% and the Dow slipped 0.30%. The small-to-mid cap Russell 2000 index was little changed, edging up 0.04% while the Dow Jones Transports rallied nearly 1.2%. Overall it was rather an uneventful session with little in the way of catalysts or news flow. President Donald Trump’s move to cancel a planned June meeting with North Korea weighed on the market initially, but sentiment quickly recovered – which is to be expected with the VIX trading back below 13. North Korea is increasingly seen as a ‘non-event’ by the markets, with trade tensions between China and the US still dominating the headlines, but also receding as a perceived threat. The 10-Year US T Bond yield steadied near 2.9% in the wake of the FOMC minutes released earlier this week. Valuation support for the US market is at the forefront with investors as the US economy continues to deliver – with inflation still over the horizon and yet to emerge as headwind. The upcoming June earnings quarter will likely reaffirm consensus EPS forecasts of more than $170 for the S&P500. This would price the Index on an attractive forward PE of less than 16X – so I see near term downside risks as diminishing, with the bull case increasingly justified for a renewed challenge of the record highs. Near term, there seems to be little in the way holding the US indices back for another run to the upside. I therefore think on balance, May is shaping up as an outlier month (in terms of posting a positive performance) with the indices readying and consolidating ahead of a strong start to June. 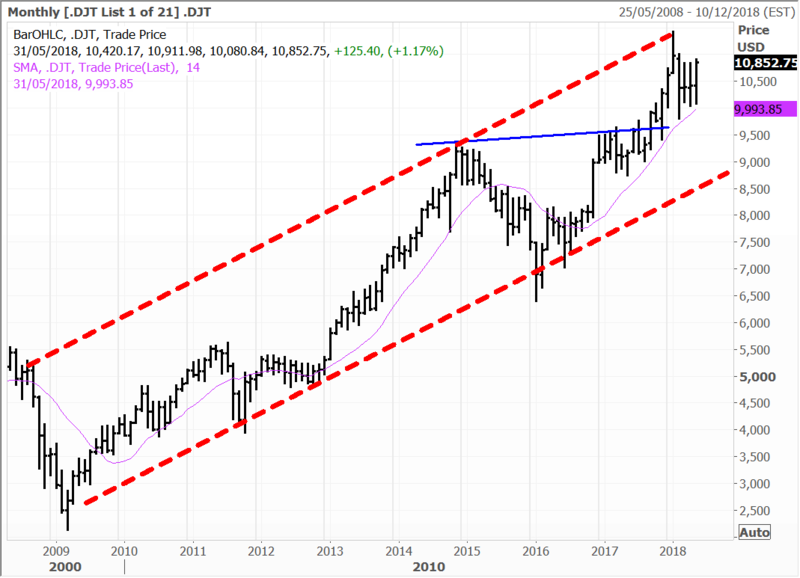 The Dow Jones Transports on a monthly chart remains confined within an upward trend channel, currently positioned just below record highs – see below. Dow Theory posits that the “transports” are central to not only the health of the US economy, but also the underlying condition of a bull or bear market. At present there is no sign of any deterioration with the DJT, which looks set to accompany the Dow and S&P500 higher, whilst the Russell 2000 has already reached a new summit. In corporate news Netflix advanced 1.3% to hit new all-time highs, as investors have welcomed the decision to bring on board former President Barrick Obama and his wife Michelle to produce original content for the streaming giant. I have some reservations about a lot of Netflix content which has been expensive to produce, with not all of it commercially or critically successful. 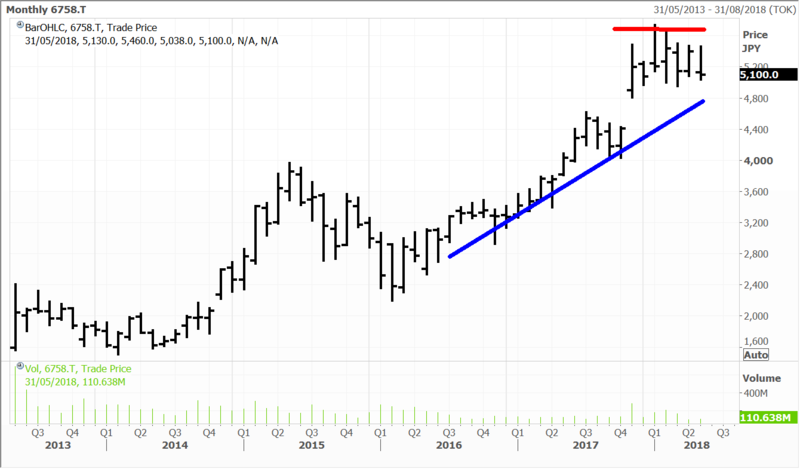 However, none of this stopped Netflix hitting fresh highs and its market capitalisation has crested $150 billion – surpassing Disney’s (-0.8%) valuation – which is an opportunity in my view. Disney shares have drifted with the market waiting on details of Comcast’s all-cash bid for most of the assets of 21st Century Fox (+0.4%). The concern is that that a bid from Comcast could spark a bidding war where Disney ends up overpaying for the Fox assets. As I wrote yesterday however, Comcast is desperate to avert what is becoming a secular decline in cable TV with streaming now very much in ascendance. Fox and Disney are more about “content” and “brands”. A combined Disney/Fox entity will not only be able to produce a formidable streaming offering, but better compete in a rapidly changing media landscape. Apple is reportedly working with Volkswagen to adapt some of the German automakers T6 Transporter vans into self-driving shuttles for employees. This is part of Apple’s efforts to advance its secretive autonomous driving efforts. Apple is speculated to be significantly lagging leaders such as Alphabet’s Google and Baidu with the latter company leading the self-driving push in China. Apple, Alphabet and Baidu shares were little changed on the day. Hong Kong-listed Macau casino operators got some support from the latest tourism data out of Macau. The average room rate across 3 to 5 star hotels increased 3.5% year-on-year to MOP1,302.8 ($162) in April. Overnight visitors to Macau rose 7% year-on-year for the month to 1.54 million. Shares of MGM China, which has the most recently opened addition to the Macau casino scene, gained 1.8%. In Australia the market managed to eke out a gain on Thursday, with the ASX200 closing up 4.6 points at 6,037. Sector wise performances were mixed, with the resource stocks and banks mostly lower. Gold stocks had a good day, with Evolution Mining putting in a rise of 2.85%. Sony’s PlayStation 4 (PS4) console is now in the “final phase” of its life cycle according to comments from the new PlayStation boss John Kodera. That is no real surprise as the console launched in November 2013 and will therefore be five years old later in 2018. It is still going strong and has been a huge success for Sony, with 79 million units sold to date and huge numbers of associated sales. The PlayStation Network had 80 million plus MAUs (monthly active users) as of March 2018 and paid PlayStation Plus members totalled 34.2 million according to presentation slides shown at Sony’s Investor Day this week. For the latter, that represented an almost 305 year-on-year surge. Some 246 million PS4 games have been sold and segment operating has steadily increased and been a major factor in Sony’s impressive turnaround over the past five years or so. Cumulative cash flow from the PS4 has summed to about $6.3 billion. While there were no definitive dates discussed, Mr Kodera’s comments have been interpreted by some as pinning the release of the PS4’s successor a few years out in 2021. Admittedly that was based on the rather cryptic (but enigmatically cool) reported phrase that in the fiscal year ending March 2021, the PlayStation unit will “crouch down once more” to grow again. Sony’s PS4 should remain a strong contributor for the rest of the cycle due to the evolution of the console, such that software and add-on content, along with network revenues, will offset slowing console sales as the PS4 ages. We hold Sony in the Global Contrarian fund and the international managed account portfolios. Disclosure: The Fat Prophets Global Contrarian Fund declares a holding in: Disney, Volkswagen, Baidu, MGM China, Evolution Mining and Sony.